I believed up until relatively recently that I was a mixed-race Dubliner. ‘My dad is a North Sider, and my mother is a South Sider!’ I would declare, explaining away my propensity for Chipstix-and-cheese bread rolls washed down with a carafe of Amerone. My brothers and I have always joked that my Coolock-born dad must have nicked our Dun Laoghaire-born mother’s handbag, led the chase north of the Liffey and eventually coerced mam into staying there. But on a recent stroll with my ‘South Side’ Mother, she told me that her maternal grandmother actually owned and ran Whelans’ pub in Summerhill with her husband, and that is where my grandmother was born. ‘Oh yes’ says she, in her (totally fake) Dun Laoghaire accent. ‘We used to sit up on the roof as children and look out over the entire city’. So it would seem, ma mére, so it would seem. My personal existentialist nightmare aside – I’ll eventually work it out in therapy – I have always been a Dub And A Half. I’m the kind of Dub whose dad brought my brothers and I to matches in Croke Park when the local vendors were still on the premises, with prams and carts full of chocolate bars and bags of crisps for sale. ‘How much for the bars?’ my dad would enquire. ‘30p each or three for a pound, love’ came the butter-wouldn’t-melt reply. ‘I’ll take the three, so’ he’d say, and happily hand the pound over. My dad was, and still is, an accountant. Surprisingly. I’m also the kind of Dub who tried to leave and live in other countries for work over the years, thinking that I might be happier, or more at home, in some other better place else. I wasn’t, and there never was a better place. Every time that goddamn plane descended and the east coast came into view as I arrived back, a lump caught in my throat and I was always so unbelievable happy to be back here. I feel like I so thoroughly know the people in this city, that we share the same blood, that I can stop and pass the time with anyone who has a moment to chat. And if they’re not interested, or stare me down, or refuse to acknowledge this fellow Dub who is hoping to have a gasbag about the weather, the fab deals you can get in Penneys, the hack of the Spire or how the seagulls are getting more aggressive..
Well then, I just think..
..they’re probably just from Dun Laoghaire. 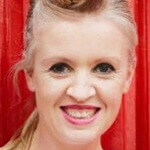 Sharyn Hayden is a journalist with parenting website www.herfamily.ie. She is also an author and comic actress. Her debut book ‘I Forgot To Take My Pill! debuted worldwide in May 2015. She lives in Dublin with her two children Jacob and Eva.